My mission as a ceramic artist is to continually explore alternative firing techniques that present unique challenges. The process of Raku and Barrel firing allow for much experimentation and add a sense of adventure in creating pottery. I enjoy creating graceful pottery forms upon which I allow the power of the flames to produce their spontaneous effects. These firing techniques tend to create pottery that is left to chance and can yield fantastic and exciting results. Many of my greatest influences in design come from the natural world. The primary focus of my work is to create a pottery surface that will convey a “Mysterious Presence”. Chad started pottery in 1987 at Apollo High School in St. Cloud, MN. He graduated from St. John’s University in 1994 with a BA in Studio Art and minor in Secondary Education. Chad is currently teaching middle school art at VandenBerge Middle school (1995-present). 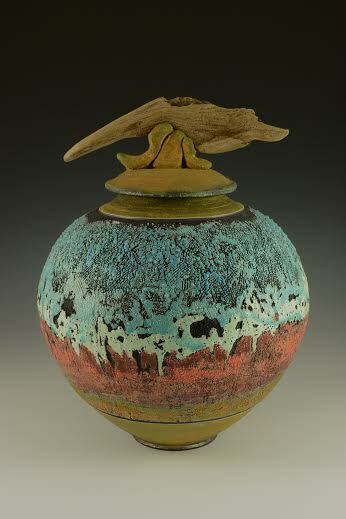 He also is working in Raku, saggar, and barrel-fired work (2008-present).